June 2018, WSJ, “It’s Trump’s Economy Now – Liberals want to keep crediting Obama—never mind their own 2016 predictions of disaster.” (Sorry, it’s behind a paywall but the title says it all!) Democrats were saying we had to get used to the “new normal”…under 2% growth…an services only economy without manufacturing, energy production, or a thriving middle class! This entry was posted in Business and Industry, politics. Bookmark the permalink. 6 Responses to Who Built That? One pix is worth 1000 words. And NONE of them are complementary to Obumble! I tagged him as Obumble within the first couple of months of his taking office. And he lived up to it! But now, I must revise my choice of name to Obullsh**. Well, the United Nations’ General Assembly had a good chuckle over the concept today. And The Donald’s reaction? … oblivious, as usual. You sure miss a lot…must be that bad attitude! So oblivious he didn’t ever respond!!! (NOT) Libidiot. If Hussein al Obama built this economy and President Trump is only carrying on Hussein’s policies, why aren’t the democrats applauding Presidebt Trump??? 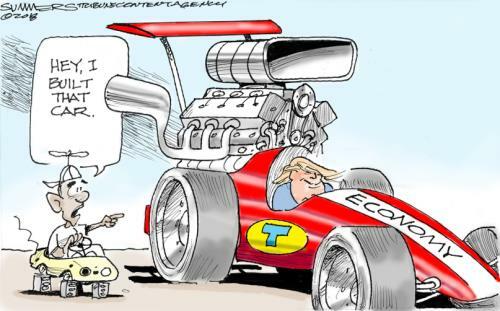 Hey, Hussein – YOU DIDN’T BUILD THIS ECONOMY! !